Your car isn’t the only thing that needs to be waxed and buffed. Spring Break is almost here and we are ready to support you in looking and feeling your best. Plan to play and relax in the sun? Our waxing specialists will get you in top shape with minimized discomfort. Plus, waxing is known to pronounce your musculature, having you look more toned and buff. The Benefits: Wax hair removal is a method of removing hair from the follicle. Waxing lasts 6-10 weeks and over time with regular waxing hair can become less dense and softer making it easier and less painful each time. The Modern Male Experience: We use a soft wax system that is gentle on your skin and completely sanitary without risk of contamination. We finish each service with an antibacterial treatment. Moreover, we only serve men, making our waxing specialists experienced in effective techniques and how to reduce pain during the process. Preparation: In preparation for your service schedule your appointment several days before you leave for vacation. Refrain from using a tanning bed 48 hours prior to waxing. Do not take aspirin within 24 hours of the service. Your specialist will trim your hair if needed, so please do not trim before coming in. Care: After your wax service it is necessary to care for your skin with the proper routine to reduce the opportunity for breakouts and bumping. Your technician will recommend which products will serve you and your skin’s needs best. Plus, receive a free gift on us when you come in for your wax during the month of March. 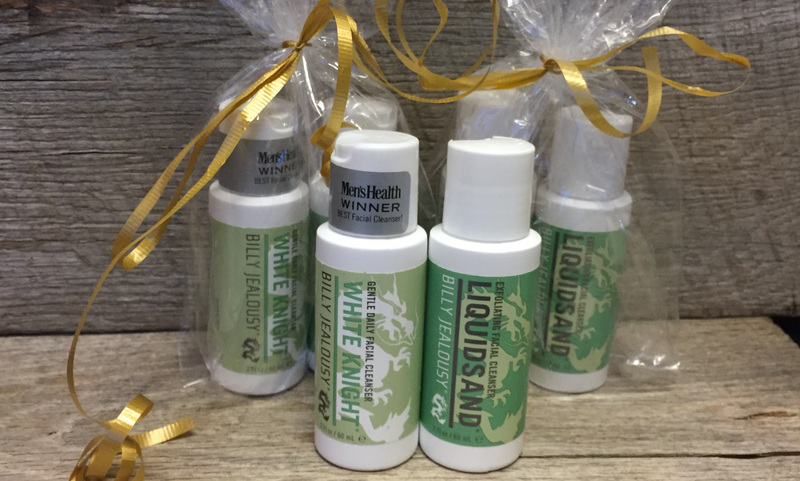 These Men’s Health award winning facial cleaners from Billy Jealousy will give you exactly what you need to be fresh faced and waxed for your well-deserved vacation. Mention this offer for your free gift.